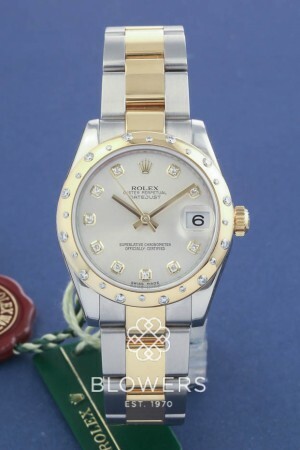 Bi-metal Rolex Oyster Perpetual Mid-size Datejust 178343. Case diameter 31mm, water resistant to 100 meters. Domed diamond bezel. Silver diamond dot dial. Bi-metal Oyster bracelet. Box and papers dated October 2011, service papers dated August 2017. SKU: 3004067. Categories: Datejust & Date, Ladies, Rolex.